Thus the title of a famous motet by Guillaume Machaut, the great late medieval/early Renaissance composer. And thus, this blog ends. Longer explanation follows (along with an irresistible link!). It's become much too hard to be an American. In my case, I took a break from the middle of a pretty decent career, to add my dissenting voice during what was -and remains- a national emergency. Although my career hit some major snags as a result, I will never regret what I've done. How could I be a decent father to my daughter, let alone a responsible citizen, and not have tried to do at least something to prevent the madness of the Bush/Iraq war? While the past year and a half has been in some ways enjoyable, and I've learned a great deal, constant exposure to the toxic nature of George W. Bush and his world has taken a serious toll. In more ways than I care to remember, my health has suffered, as has my emotional well-being. In a nutshell, America is now asking too much of its citizens in order to save it from heading over a cliff. That is why we elect representatives, so that we can do our work and not have to run a government. We're supposed to have a responsible and free press, so that normal folks need not work 24/7 exposing the lies and crimes of our leaders. Don't get me wrong, I'm glad to do my bit, but I've already done more than I reasonably could. Politics, political writing is not my field, never was, never will be. There is a limit to how much I can do, how much basic research I'm qualified to undertake. I tried to exceed that, but I am simply not capable of continuing to do more. It's time to get back to work. I have too much music I need to write. I had a lot of fun writing this blog, learned a lot, met many fascinating people who are far more intelligent than I, always a pleasure, and who I wish I could thank properly not only for their hard work, but for the pleasure and comfort it's given me. I may drop a line or two on this blog every once in a while. And I'll never stop caring about the issues that got me started in the blogosphere in the first place. But this is the time, as the great poet of the "old weird America" once sang, to keep on keepin' on. Thanks, all of you, for reading. I wish all of us luck. PS: And now, in the spirit of a Dixieland jazz funeral, one last link to break the mood, courtesy of my dear friend, JB. A catastrophic catastrophe. Losses in the House, losses in the Senate, and Bush will almost certainly win. That he is ahead in the popular vote by 3 1/2 million is frightening enough. For those who expect more of the same over the past four years, I strongly urge you to stop kidding yourselves. It is about to get worse. Much, much worse. For those who say, well, the bright side is that Bush will so wreck this country the moral and political bankruptcy of conservativism will be apparent, I say, don't even start to go there. The full brunt of the Bush disaster will fall not on the middle class, let alone the upper middle class, but on the poor, the marginalized, and the lower middle class, who will suffer terribly. An attitude that dooms the poor to more suffering in the cause of a better society strikes me as the height of immorality. Now what? Well two broad topics are on my mind this morning, one political/national, the other personal. The Democratic Party, as it currently exists, is doomed as a party of national influence. Notice: I wrote, "as it currently exists." It is possible that the extensive infrastructure of the party can be salvaged to construct a genuinely effective organization. But that is contingent upon an entirely new leadership that enthusiasitically embraces the grassroots activism we saw develop over the past three years. The guys in charge right now are hopeless and they have to go. All of them. Right now. If the Democrats fail to change, and change quickly, the only alternative is to abandon them. I am not the only American who was spurred into intense activism over the past 4 years and donated thousands of dollars, far more than I could afford to the Democratic Party and to various Democratic candidates. To say the least, I am extremely disappointed. Given such fantastically opportune circumstances - a Republican hegemony of unmitigated incompetence and disaster; opponents, like Bunning, Coburn, and Keyes, who all bordered on the verge of lunacy; and an exceptionally great flagship candidate - there are simply no excuses for such disastrous results. So... Unless there are some major changes, and fast, the Democrats will never get another dime from me. I'll simply find another group (for the sake of discussion I'll say it's MoveOn, but it could be some other mainstream liberal political organization) and I will treat them as a defacto party. I will support whoever they endorse but only as candidates of that party, NOT as Democrats. If direct donations are not possible without going through the Democratic mechanisms, I will simply donate to MoveOn and let them disburse the funds. If the Democrats don't get rid of the awful leadership that created this disaster, lots of people will join me in putting our money into a party that not only reflects our politics to some extent, but can also win. Obviously, there is much more to be said here. An effective opposition party will certainly require a rhetorical strategy as pithy as the Republicans and clear policy initiatives plans that are clearly superior to the Republicans. Developing these is not a trivial undertaking. Perhaps the most breathtaking insight that I came to over the past 2 years of concentrating on American politics is how utterly mediocre most of the "expert-level" literature on politics is. I knew the media were awful. I knew the Republicans were hopeless, and the Democrats couldn't articulate their ideas terribly well, but I assumed that if I read Foreign Affairs and books by authors at that level, I would encounter plenty of great thought. I didn't. In foreign pollcy, for instance, I found the only most laughably crude formulations: Realism vs. Idealism, or The End of History, or Rational Choice Theory. I found precious little writing that grappled with international realities in a truly sophisticated way, and no one who had a convincing overarching theory. If it's all too true that in the Bush administration the lunatics are running the asylum, then at the thinktanks the third-rate are teaching their inferiors. The United States has a dangerous intellectual crisis on its hands. Whatever the reasons for this appalling situation, somehow, truly smart people must once again start writing about political philosophy. There aren't any. In terms of brainpower or mental stability (or both), people like Fukuyama, Wolfowitz, Pipes, Kagan, Pollack or even Mead (forgive me, my friend) simply aren't cutting the mustard. Surely, the Old Wise Men, like Kennan, weren't that wise, but they weren't clowns. But the awful truth is that there isn't a single person on the preceding list who hasn't been spectacularly wrong, terribly wrong, about the world in the past four years. And yet, they continue to be regarded as among the shining lights of foreign policy wonkery. I'll address the personal in a post later today. No excuses, my friends. Got the flu? Drag your sorry tuchus out of bed and vote. Got a bad deadline? It can wait an hour or 7: Vote. Lines too long? Bring a book or better yet, gather up your slacker friends, throw a queue party and vote. Think your vote doesn't matter? You gotta be kidding. Think you're above the unseemly farce? If you don't vote, you're the joke. Think the election's fixed? It can't be if it's not close and that can only happen if you vote. Did I mention how important it is to vote? United States District Judge Susan J. Dlott in Cincinnati found that the application of Ohio's statute allowing challengers at polling places was unconstitutional and that allowing any candidates other than election judges and other electors into the polling place would place "an undue burden upon voters" and impede their rights to vote. In a similar case, United States District Judge John R. Adams of Akron said poll workers should be the ones who determine if voters are eligible. With the rulings, the judges made clear that they did not want partisan challengers to voters' ballots inside the polling places, and that the disruption that such challenges would create outweighed any potential voting fraud, which Republicans had cited as the reason for the challengers. Of course, there will be appeals. And if Ohio is close, this will be part of their case. Still, it's good news because voting won't be held up. Considering how important this election is (I'm 52 and I can't remember a more important one, not even '68), I find it rather astonishing that the topic of your column today focused upon the woebegone appearance of the Capital. What story could you have told instead? There are many, but here's one that's vital: Voters, millions of them, have focused on the substantive issues in this campaign. In response, both pro-Kerry or Bush, they have participated in unprecedented numbers in get-out-the-vote drives, they have marched and demonstrated, phoned voters in key states, debated over the dinner table about complex nuances of foreign policy, and worried in a serious fashion about the future direction of this country. Now the standard journalist riposte to a reader's request to "get serious" is, "why don't you just lighten up?" Mr. Hiatt, being frivolous is what comedy shows are for, or at least what they should be for. It is an indication of how irresponsible the press's mainstream coverage has been that, at present, a comedian specializing in fake news has become for many observers the New Cronkite, "the most trusted man in America." Your latest column is a prime example of why that is so. Because what kind of journalism could be more fake - on the day after 9 more marines were killed in Iraq, on the eve of a major US/Iraq offensive against a city of 300,000, AND on the day before an American presidential election - than a provincial rant on the ugly appearance of Washington, DC? Your column may have been meant as metaphor or satire. Instead, it read as a joke. A poor one. Hat tip to the incomparable Bob Somerby, who properly retains his sense of outrage at the press's inanities, no matter how many outrageous inanities are published. Tora Bora: What Really Happened? So: Was al Qeada's leader at Tora Bora? According to a widely-reported background briefing by Pentagon officials in mid-December 2001 there was "reasonable certainty" that bin Laden was indeed at Tora Bora, a judgment based on intercepted radio transmissions. In his autobiography, American Soldier, General Franks himself recounts a scene in Waco, Texas in December 2001 where he briefed President Bush saying, "Unconfirmed reports that Osama has been seen in the White Mountains, Sir. The Tora Bora area" Moreover, Luftullah Mashal, a senior official in Afghanistan's Interior Ministry, told me that based on conversations he had with a Saudi al Qaeda financier and bin Laden's chef, both of whom were at the battle, bin Laden was at Tora Bora. In June, 2003 I met with several US counterterrorism officials who told me, "We are confident that he [bin Laden] was at Tora Bora and disappeared with a small group." And Palestinian journalist, Abdel Bari Atwan, a consistently accurate source of information about al Qaeda, has reported that bin Laden was wounded in the shoulder at Tora Bora. Indeed, in an audiotape released on al Jazeera television last year bin Laden himself recounted his own memories of the battle. "We were about three hundred holy warriors. We dug one hundred trenches over an area of one square mile, so as to avoid the huge human losses from the bombardment." In short, there is plenty of evidence that bin Laden was at Tora Bora, and no evidence indicating that he was anywhere else at the time. But as with the National Intelligence Estimate, it is not 100% certain, therefore because it is politically advantageous, Bush and his cronies phrase it as "who knows? Maybe he wasn't there." We want people to think 'terrorism' for the last four days," said a Bush-Cheney campaign official. "And anything that raises the issue in people's minds is good for us." ...the new tape - which is so nakedly political that it should end with the words "I'm Osama Bin Laden and I approved this message" - makes it difficult for Kerry to keep hammering Bush on the subject without appearing to be capitalizing on terror. In other words, Kerry needs to shut up while Bush spins evidence of his incompetence into a little gift. With only one close US presidential election per century it is a very safe prediction that it will not be close this year. To be precise, historically there is one chance in 25 that this election will be close. My "Landslide to Kerry" prediction was met with jeers at the time. And readers may well ask once again how I can predict landslides when almost all US experts are saying the race is too close to call. My answer to that is to assert (based on 50 years of experience) that nine times out of 10 supposedly "too close to call" elections turn out to be landslides on the night. The most recent example of a typical case was Australia's election on October 9. Do you remember those experts on the ABC's Insiders program. Did not most say our election was too close to call? The famous English psephologist David Butler has an aphorism for this phenomenon. He says: "Electoral history is littered with unexpected landslides." I noted above a quite minor revision to my February prediction. Let me now admit that I would not be surprised if Bush carries Missouri. Suppose that Bush does win Missouri but that all my other predictions are correct. 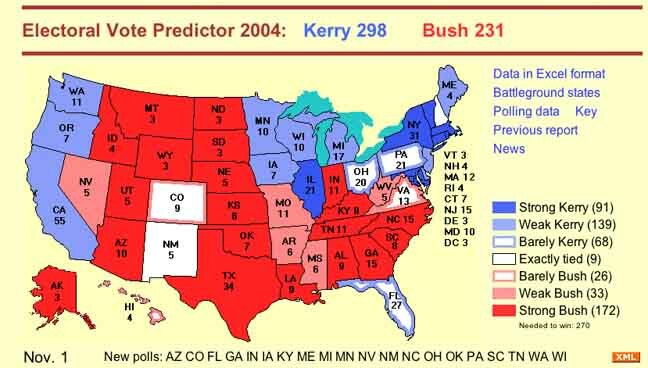 The election would then result in 316 votes for Kerry and 222 for Bush. I would still call that a landslide. As an historical note, this means I am predicting a result that last occurred in 1956, namely the nation voting for the winner and Missouri voting for the loser, except with the parties reversed. In 1956 Missouri voted for the Democrat loser Adlai Stevenson while the nation voted for the Republican winner Dwight Eisenhower. Finally, let it be noticed that results like my predictions are quite possible even if the popular vote is close to 50-50 between the two men. That would not surprise me. I feel sure, however, that the result will be quite clear-cut in the Electoral College. And that, after all, is what really matters. There is simply nothing to add to this.